Doritos Locos Tacos: The Best Marketed Product in Recent History? The commercial begins and the man brings a box of tacos and immediately the party is on. In less than 30 seconds, Taco Bell establishes a product story -- Taco Bell is the party food. Whether you believe the story or think the story is simply ridiculous, you and nearly everyone in America knows this story. This means if you bring Taco Bell (especially the Locos Tacos) to the next party, everyone will get the reference. You can then all enjoy taking part in that commercial's party story -- even if it is completely ironic. Taco Bell's products like the Doritos Locos Tacos are a phenomenon and they are a phenomenon not only because Taco Bell created a relatively good fast-food product, but also because they created a ridiculously successful product story. This is a completely different idea of what a company should do. Instead of creating just products, they can create a shared cultural narrative for people to communicate through, participate in, and share through pictures and twitter. It appears that Taco Bell has been reading a little marketing psychology. Here's the breakdown of why Locos Tocos and Taco Bell in general may be one of the best marketed brand in recent history. Bringing Locos Tacos to a party for many groups may seem clever. It's a physical way to make a funny pop culture reference. Since everyone has seen the commercials, everyone knows how to respond when someone shows up with Locos Tacos. The commercials provide social facilitation which reduces awkwardness and can even provide an ice-breaker as everyone references funny (or ridiculously overstated) lines from the ad campaigns like, "cool ranch homie" or "before I die". What people buy is based in large part on what comes to their mind. When people consider a party, Taco Bell may come to one's mind easier than any other fast food. In his book Contagion, Jonah Berger talks about the importance of associations and what he calls triggers. For instance, Cadbury has done a good job at associating their Cadbury eggs with spring. Triggers and associations, not just quality of products, are important to purchase decisions. If people don't think about the product they won't buy it. When we expect something to taste good, it will actually taste good. For instance, experiments show that wine tastes better when people think it is expensive. As long as a food product is at least somewhat good to begin with, advertising can make it taste better. A taco that would normally taste okay, may taste amazing if we see a lot of ads that tell us it will be amazing. With Locos Tacos, we may expect and even want to enjoy it. So when we have that first taco at a party we might think to ourselves, "Hey wow this is really good." And because the commercials have given us an idea of what Locos Tacos fandom looks like, we may begin to immediately imitate that crazy fandom through words and behaviors. For instance we may say, "It's like a fiesta party in my mouth" and nod our head to imaginary beat like the people in the commercials. 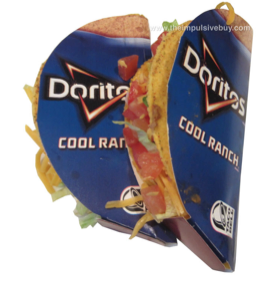 We might even tweet (ironically), "Cool Ranch Tacos! Best idea ever! Duh! #LiveMas." In 14 months Taco Bell sold 500 million Locos Tacos. They accomplished this because they did not just simply create a product. They created a fun story, triggers to remind people to purchase, the expectation that the product would be good, and the vocabulary to describe enjoyment of the first bite and begin fandom. When people think of marketing, they often think of lies, tricks, and deceptive sales. Modern marketing is so much more than that. Taco Bell has created an enjoyable story. A story that almost mocks itself in how ridiculous it is, but a story we love buying into, even if only ironically. Instead of lying to us, Taco Bell invites us into the lie, where we participate in exaggeration of how amazing the tacos are, in service of our own enjoyment.